Born in Birmingham, England, Thomas Hill came to the United States as a youth, following his father to Massachusetts in 1844. He worked briefly in a cotton factory, became an apprentice to a carriage painter, and later joined an interior decorating firm in Boston. 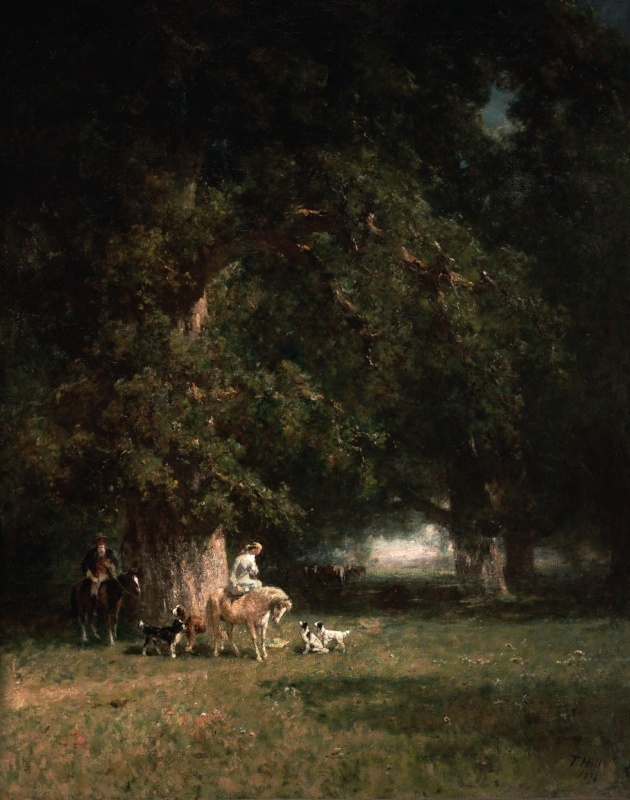 He moved to Philadelphia in 1853 to study art, enrolling in night classes at the Pennsylvania Academy of Fine Arts. A year later he visited the White Mountains of New Hampshire, a region associated with painters of the Hudson River School. He departed for California in 1861, at the outset of the Civil War. Hill revisited New England several times after moving to California and painted Waverly Oaks, a spot outside Boston favored by American Barbizon painters, on multiple occasions. He may have used either his own earlier oil sketches or photographs to compose this idyllic scene.